There had been a boycott by some nations in 1976. The USA decided not to attend these Games because of, ironically, Soviet incursion in Afghanistan. The 70s had seen an effective British boycott of contact with South Africa and the Tory government were in favour of non-attendance. It was left to the athletes to decide and very few of them stayed away. 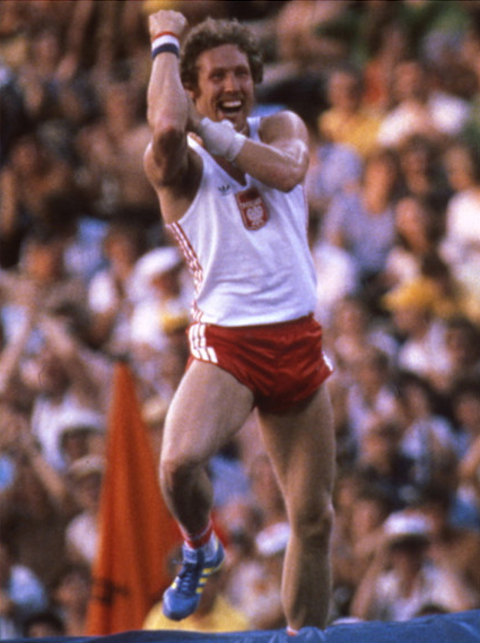 This is the winner of the pole vault, Wladyslaw Kozakiewicz of Poland. 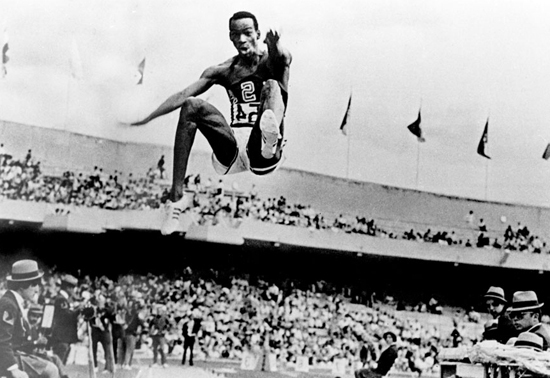 He was competing against the local favourite Volkov and the partisan crowd were not keeping quiet during his jumps. Kozakiewicz had the day of his sporting life and broke the world record. On landing his jump he let the crowd know what he thought of them by giving the crooked elbow salute. “Kozakiewicz’s Gesture” as it became known was also interpreted as a protest by the Eastern European against the Soviet Union and the Russians did protest that his medal should be withheld because of the perceived insult. In a world where soundbites by so many sportsmen and women are so asinine and platitudinous it’s just good to see someone showing their emotions in such an individual way. It was a toss up whether I would include the Steve Ovett/Seb Coe rivalry in 1980 or in 1984. There is another British hero across both these Olympics and he will get the next one. The 100m is now regarded as the blue riband event of athletics. British fans had grown up with the stories of the first 4 minute mile by Roger Bannister, helped by an outstanding generation of middle distance runners. We saw the “metric mile”, the 1500m as the glamour event. Britain had 2 outstanding athletes at this distance. They were not just rivals but very different personalities. Ovett was more extrovert. He had won the European Championships easing up and waving to the crowd. He sometimes grew a scruffy beard, a bit of an outsider. Coe had a purple patch a year later in 1979. He set 3 new world records in 41 days. He was a trim, smart polite boy. Even before he entered politics he was the poster boy for the new Thatcherite Britain. Your mum loved Sebastian and your mates were for Ovett. It really was split like that. However, if Ovett was to succeed at the Olympics then he was gonna have to raise his game. Steve was favourite for the longer distance, Seb for the 800m. In fact they won a gold medal each but in their less favoured events. This was only the 2nd time they had actually raced each other and they certainly did not appear to be the friendliest of team mates. There was a 3rd British competitor in the 1500m final. Steve Cram had to aim high if he was to be even a worthy 3rd best. By 1983 he was the World Champion. It was an amazing time for British middle distance running where we had the 3 best in the world. However they did not run against each other very often. We would go to Crystal Palace and watch all 3 win separate races with world class turns of speed. I’m sure that the egos of the protagonists got in the way. Maybe now with the benefit of hindsight they regret that they did not bring the best out of each other in more races. In 1984 I hoped to see the above image into the last bend of the 1500m final. It was not to be. Ovett had respiratory problems and failed to defend his 800m title. He stepped off the track at the beginning of the last lap. Coe went on to defend his title and Cram won the silver. It really was a golden age for British athletics with medals and world records for all 3. Steve Ovett remains a sporting hero of mine for his ability, his attitude and his cussedness. I would have loved to have had the chance to have bought the man a beer. In 1976 the concept of perfection in sport was brought into focus during the Montreal Olympics. 4 years previously Olga Korbut had charmed the world with her ability. This time around it was the 14 year old Romanian gymnast Nadia Comaneci in the spotlight. She had received the ultimate perfect score of 10 in previous competitions but no competitor had ever done this in the Olympics. The scoreboard manufacturer inquired if 4 digits would be needed and were told that this would not be necessary. Nadia’s score appeared as 1.00 to the initial confusion of the crowd. She went on to score 6 more perfect scores and won 3 gold medals. Gymnastics has always been popular in the USA and Comaneci was the sensation of the Games. Personally I feel that the ability of these teenage muscle girls is admirable but my favourite gymnast of this era remains the Russian Nellie Kim who was older (though only 19 in 1976) more feminine and more graceful so gets a photo here. The USA boxing team of 1976 is regarded as the strongest team sent by that country to the Olympics. They won 5 gold medals and 4 of these winners progressed to professional world titles. The Spinks brothers, Leon & Michael, had high profile careers but it was Ray Leonard (nicknamed “Sugar”) who caught the eye the most.He became World Champion in 1979 stopping future Hall of Famer Wilfred Benitez. In 1980 he returned to the Montreal Olympic stadium and lost his title to Roberto Duran. He avenged this loss and regained the title just 5 months later in the famous “No Mas” fight. Leonard was the most famous fighter of his generation. In the early 80s I worked in a small warehouse with a young guy who did not seem in the mood on one particular day. I asked if there was a problem and he said that Sugar Ray was appearing at a nearby gym. He really would rather be there than at work. I told him to keep quiet and clear off for a couple of hours, I would cover for him. He was surprised and pleased that I would do that for him. I did not have to make the tea for about 6 weeks ! The 400m and the 800m were both won by a powerful Cuban, Alberto Juantorena. He was the first man to do such a double at these championships. A wonderful natural runner he had only seriously run the longer distance for a year. He set a new world record in this event. Alberto is remembered as a great athlete and for a remark made by the indomitable British commentator, David Coleman who said “Juantorena opens his legs and shows his class !” Oo-er. I’ve got to be honest, real life got in the way of the Olympics in 1972. I had some important exams & went on holiday for a week. I was away from a TV for a few days. I must have watched the athletics. I don’t think my alternative lifestyle went as far as abandoning sport. I was however away for the defining event of the Games. Black September, a Palestinian cadre, entered the Olympic village and took Israeli athletes hostage killing two people. Their demands were for the release of Palestinian prisoners in Israel and of the leaders of the German Baader Meinhoff group. Negotiations quickly moved the situation forward and by the evening helicopters were ferrying hostages and kidnappers to an airfield. German authorities never intended to allow the Palestinians to leave the country but the rush to exacerbate the situation had not been conducive to the development of any coherent plan further than killing them. The shoot out went horribly wrong and 17 people died, 11 Israelis, 5 of the Palestinians and a German policeman. The games, suspended for 12 hours, continued. In the early 1970s radical groups understood the symbolism of gestures which occurred under the scrutiny of the world’s media. Hi-jacks, bombings, robberies and murders became the way these groups publicized their cause. The authorities were slow to react to this threat. There is no greater world wide event than the Olympic Games. The security surrounding the Games is understandable, any incident never mind one as disastrous and as horrible as this massacre is magnified by the intense coverage. Whether the Germans had prior warning of the raid, or were under pressure to resolve the situation as quickly as possible, mistakes were made which caused the death of 11 coaches and athletes. The women’s athletics were dominated by 3 countries and were disastrous for the USA. USSR, East and West Germany won all the events except one. Heide Rosendahl won 2 golds in the long jump and the relay. She was the local favourite for the pentathlon. It took a new world record to beat her and it was Mary Peters from Northern Ireland who made the record and took the gold. Mary had charmed the Bavarian crowd with her effervescence, her obvious delight in competing before a packed stadium. There were chants of “Mary, Mary” heard as she competed. She charmed our country as well and became Dame Mary Peters within a year. She continued to compete and in retirement became an ambassador for British athletics. This weekend she celebrated the victory of Jessica Ennis, at 73 she looked fit and well and as happy as someone who for two days performed her chosen event better than anyone had ever done. Precious Mckenzie a diminutive (4ft 9ins) weightlifter was omitted from the South African Olympic team of 1960 because he was the wrong colour. 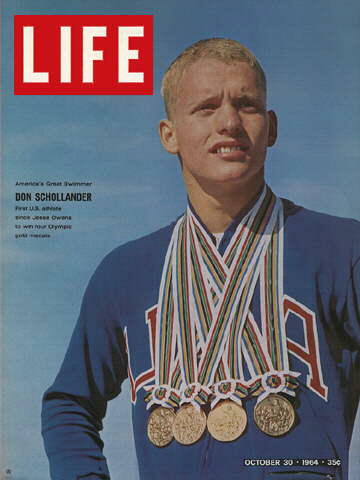 In 1964 he was told he could compete but he must be segregated from the white athletes. He refused to go and left South Africa for Britain. Fast tracked to British citizenship he competed in 3 Olympic Games. He did not win a medal but he did win 3 golds for England in Commonwealth Games. He moved to New Zealand in 1974, winning a fourth gold for them. Precious became a personality during his time in Britain turning up to do things like lift Muhammed Ali in his shoulders. I love this photograph. I hope that after the humiliations brought upon him by the disgusting regime in his home country that he found his adopted country to be a welcoming place. In 2006 he was elected to the South African sport Hall of Fame. Too little too late for a whole generation who suffered I think.